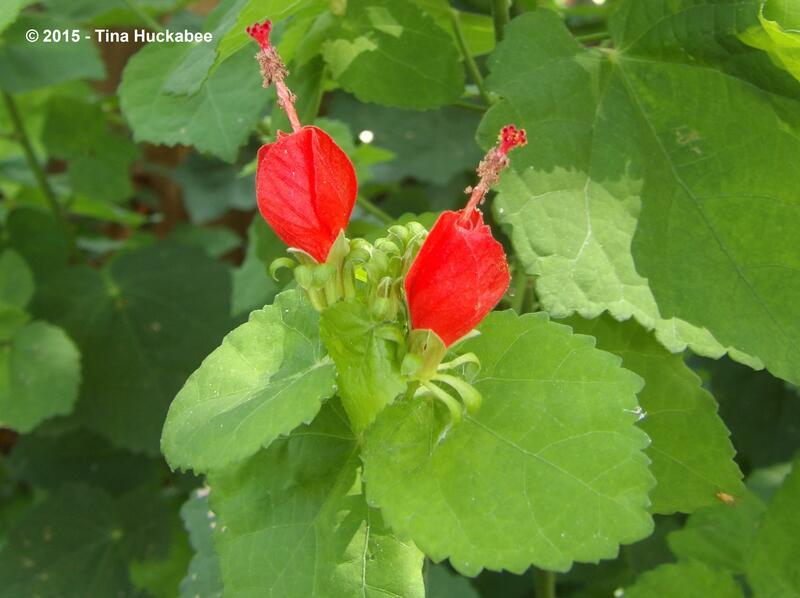 Turk’s Cap, Malvaviscus arboreus was one of the first native plants that I became acquainted with when I began my native plants gardening adventure. From the beginning, I was smitten. 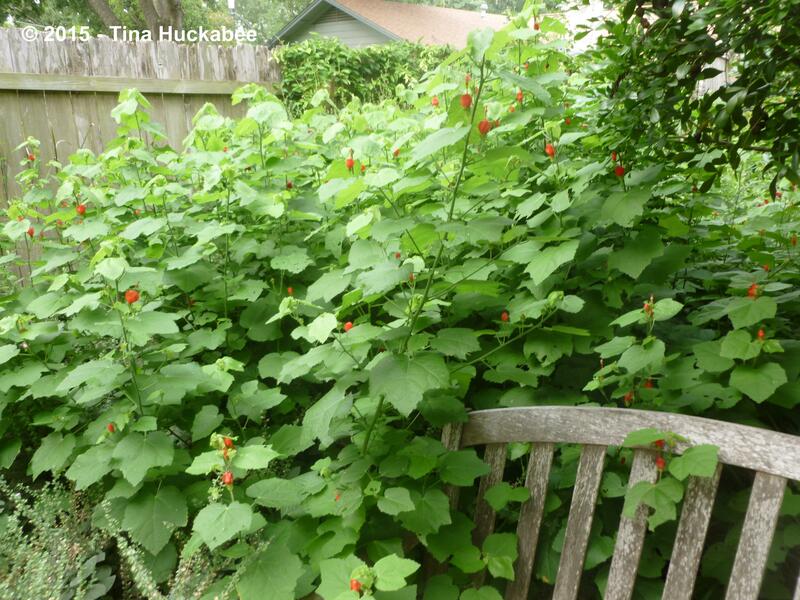 Over the years, I’ve planted seven Turk’s Cap shrubs, all of which spread and developed into large specimen plants which anchor several of my garden beds during the course of the long growing seasons here in sunny Austin, Texas. 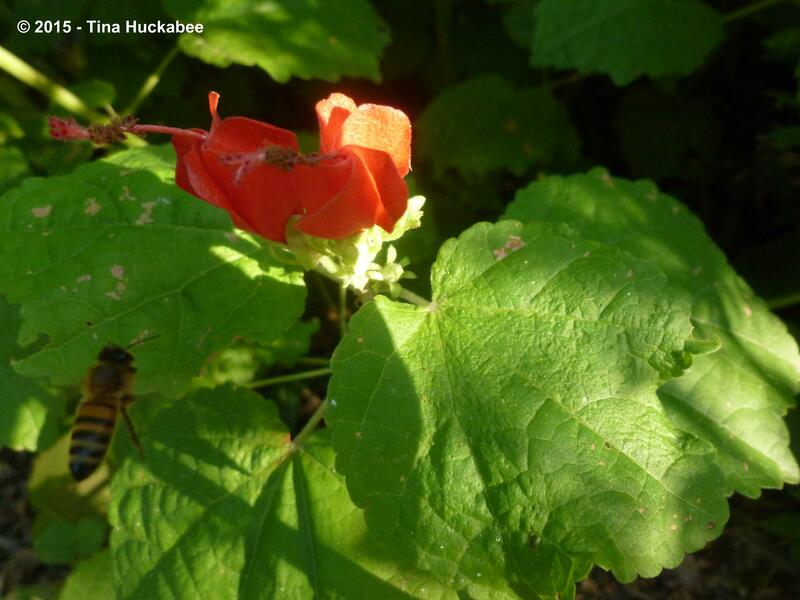 Turk’s Cap is a native southern United States plant, but is also native to Mexico and Cuba. There are cultivars of this plant, like ‘Big Momma’, (who names these??) , that are listed as herbaceous perennials in USDA gardening zones 7-10. 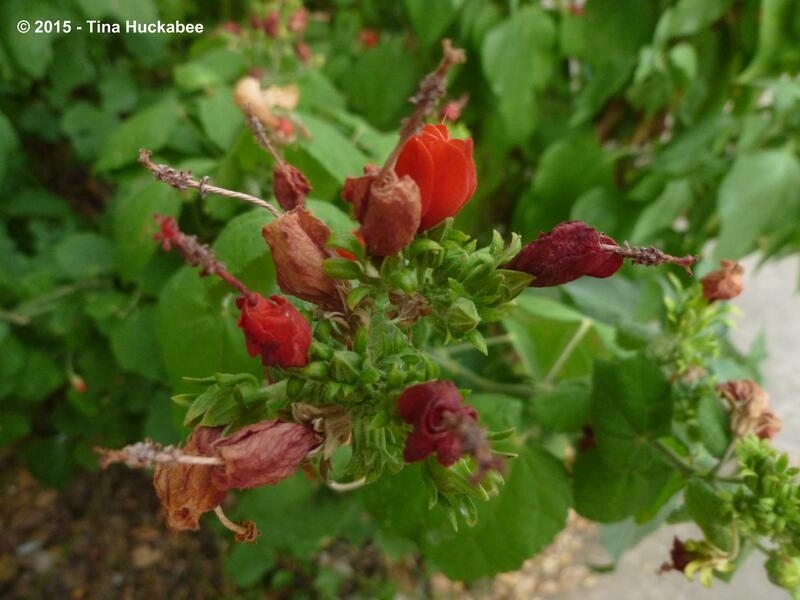 Though this native Texan dies to the ground during our normal winters (except in South Texas), this hardy shrub emerges every spring and gifts to the garden and wildlife a long and prolific parade of blooms and fruits. …but flourish in full sun and anything in between. 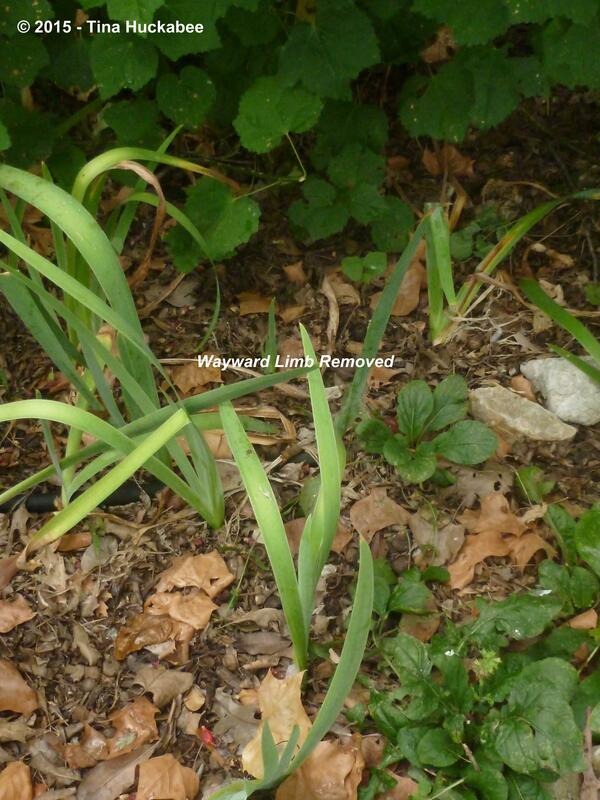 In full sun, the leaves will turn downwards, darken, and crinkle in a manner that many gardeners find unattractive. 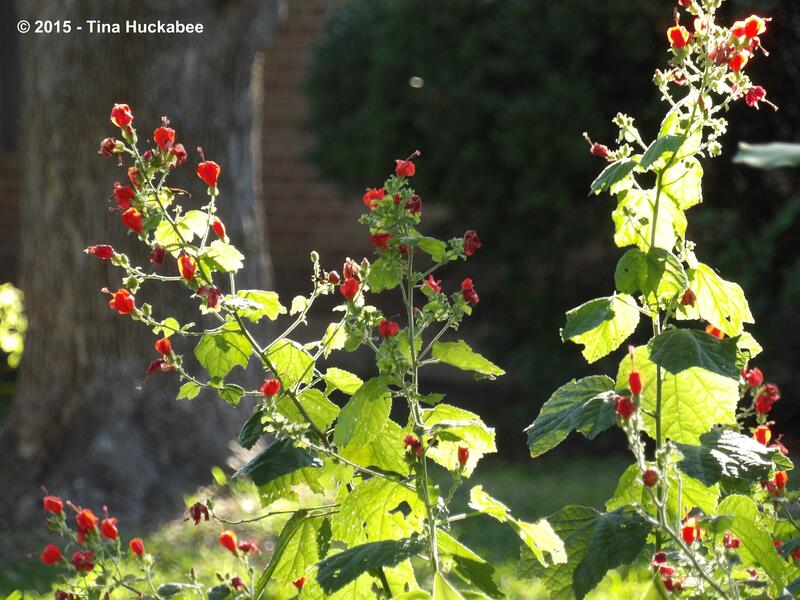 The plant looks like it’s struggling in the blazing sun and heat, but even under those conditions, Turk’s Cap is a tough and drought hardy perennial. 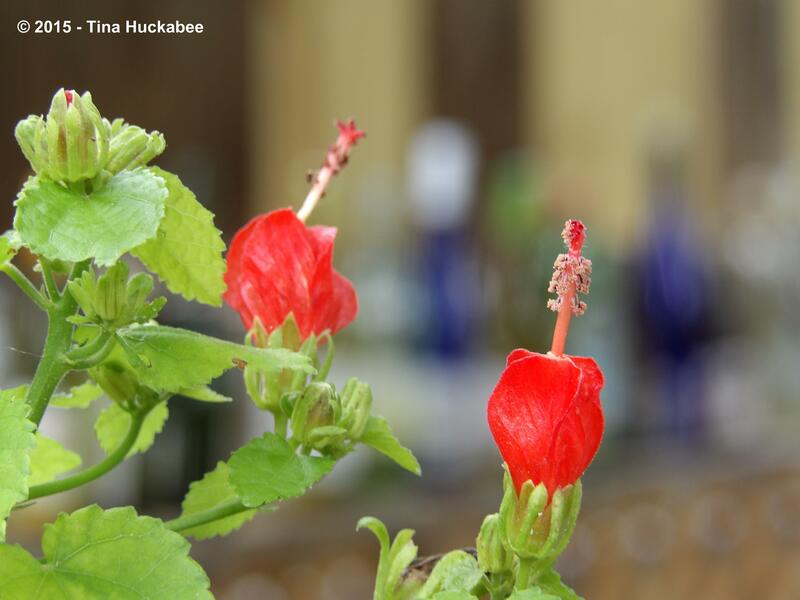 All of my Turk’s Cap shrubs grow in shade to part-shade and in fairly heavy soil, but I’ve seen others perform beautifully in full sun while planted in sand. 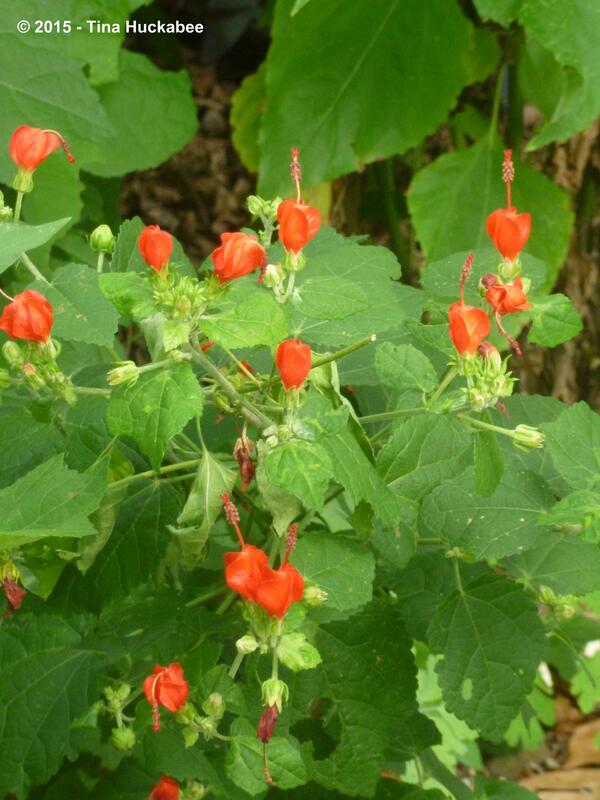 In shade and part shade though, the foliage is lush and suggestive of plants that are tropical mallows–which Turk’s Cap is! 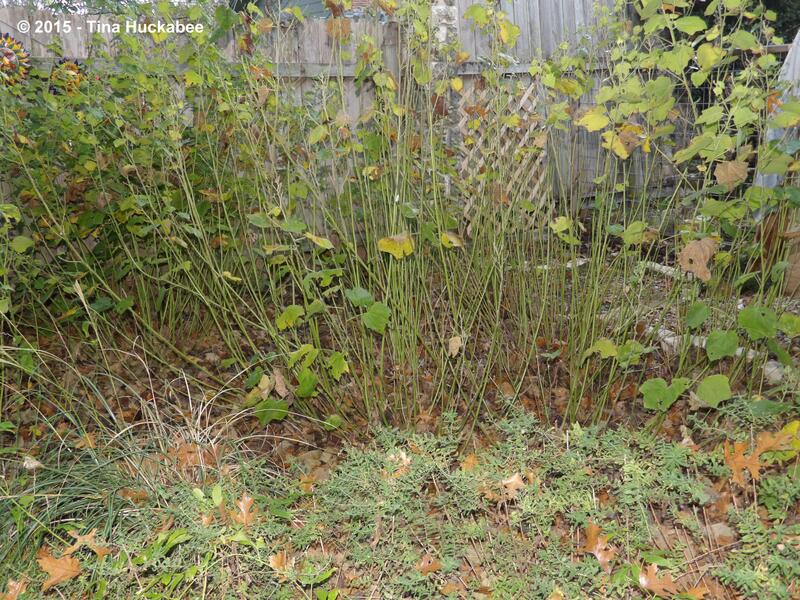 Turk’s Caps are classified as shrubs, but I always think of them as a forming in a cluster or thicket and as performing more like herbaceous perennials. They tend toward the amorphous–shooting upwards and outwards from their thick roots after winter and reaching for the sky throughout spring, summer and into autumn. 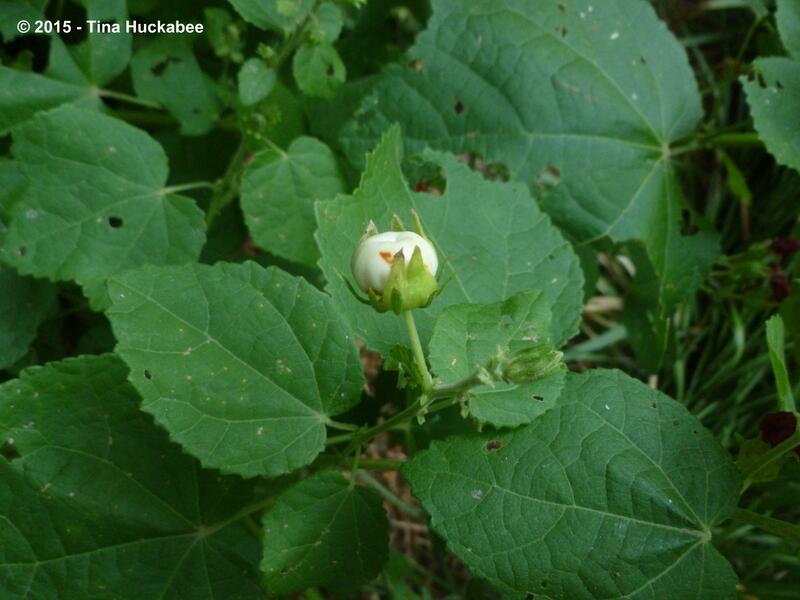 During a wet spring, Turk’s Caps grow quickly, adding lots of stem length and leafy greens. Over the course of the growing season, those stems can flop over and look rangy, especially once heavily laden with masses of blooms. 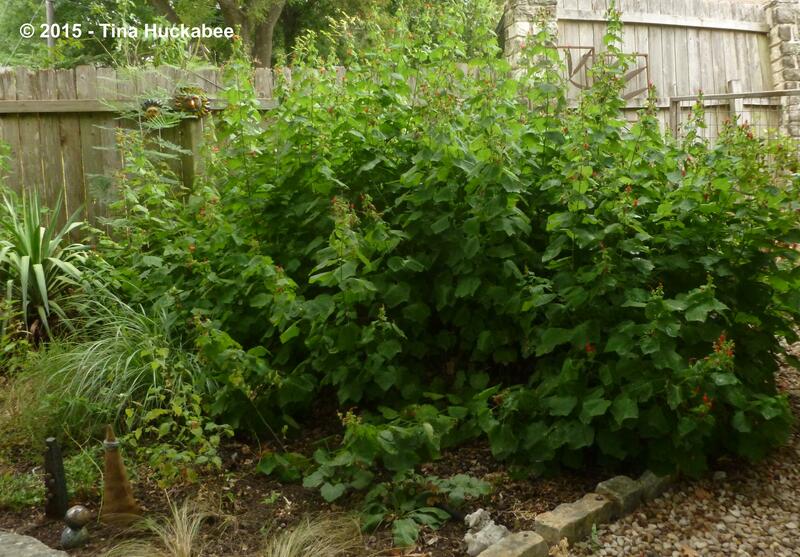 That’s a fine way to go if you’re aiming for a casual, wild garden. 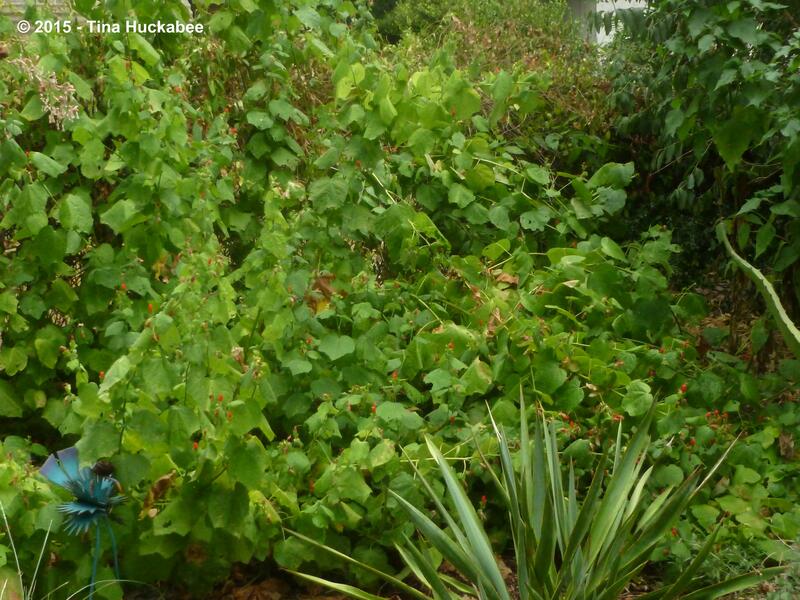 But if structure in the garden is a goal, Turk’s Caps can and should be pruned. 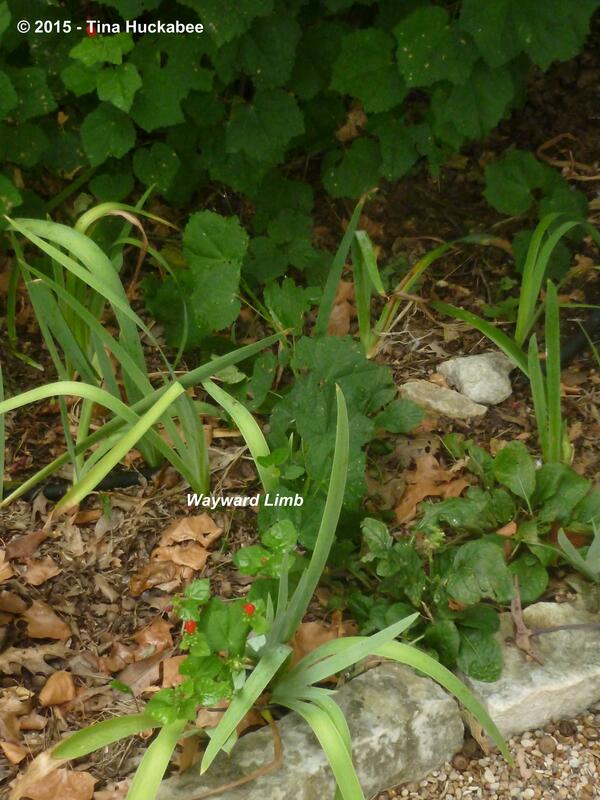 Here is an example of a wayward limb. Actually, this large bunch is one of the first Turk’s Caps that I planted and is over 20 years old. 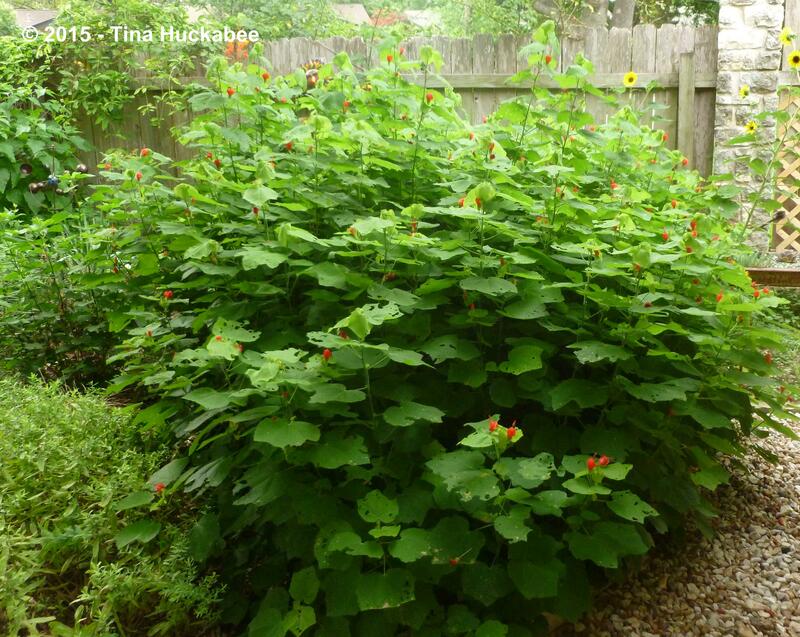 To keep the mature Turk’s Cap well-shaped, I prune up the outside limbs to about 2 feet in height, the next group inward to about 3-4 feet in height, in a graduated form, shorter to taller, toward the middle of the shrub. In general, I only prune for shape in late spring, with the occasional lopping off, as needed, in late summer or fall. It’s an easy, quick chore and I only prune what needs pruning. 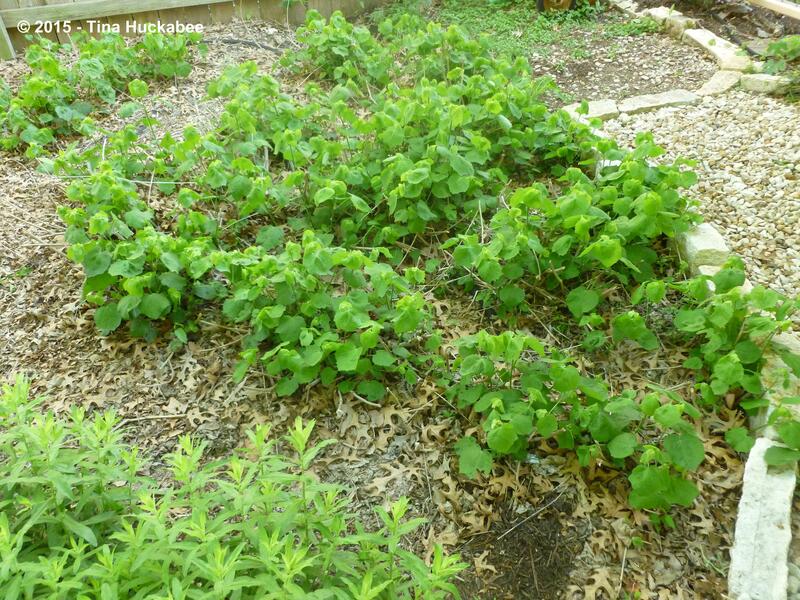 Here in Austin, Turk’s Caps emerge from the ground in early spring with fresh and vibrant green foliage. 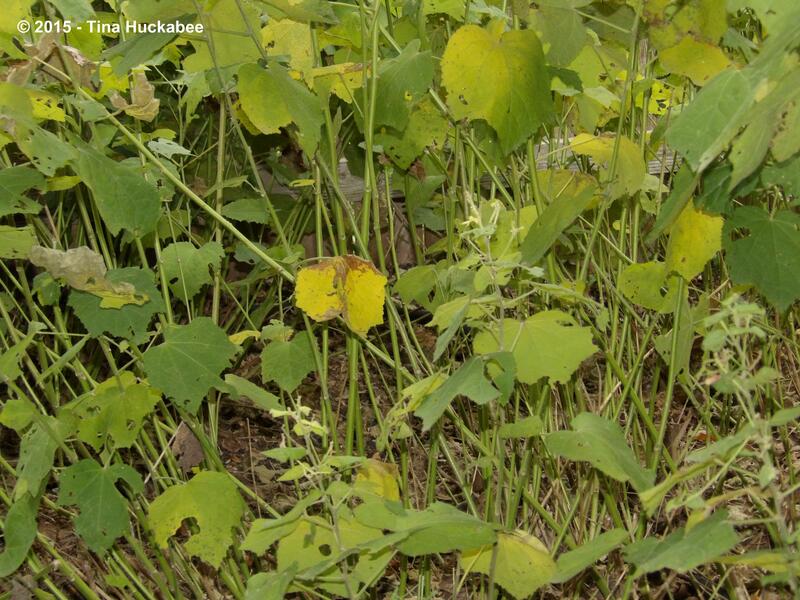 Depending upon rainfall, Turk’s Caps will grow in a moderate to rapid pace. If the spring is wet, the stems grow to about 4-5 feet, sometimes reaching 6 feet tall by late May, but often with little bloom development. During drought, moderate or otherwise, the foliage growth is slowed, but flower development (at least in my garden) isn’t retarded at all. 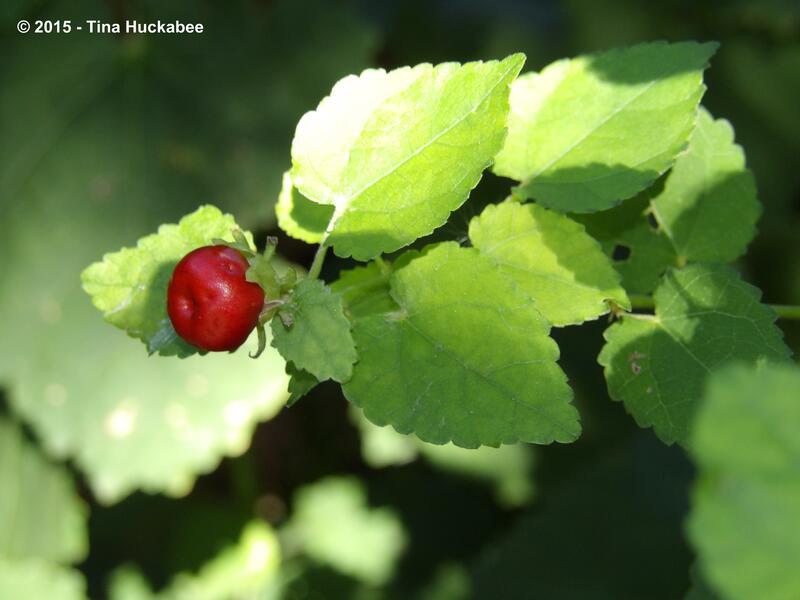 Personally, I prefer Turk’s Caps during drought–these shrubs grow and bloom, without the rank limb development that occurs in wet years; the shrubs don’t require pruning under those circumstances and that’s a good deal for the lazy gardener. Turk’s Caps begin their flower show in late spring (May in Austin) and the blooming continues throughout the summer months, with no rest. Summer is when Turk’s Caps shine. Or rather, bloom like crazy. The shrubs produce masses of blooms, each day, with each bloom lasting for several days. In a cluster, one can find buds, blooms and those destined to become fruits. The petite flowers are stunning: they remind me of a jaunty turban, complete with pollen plume. 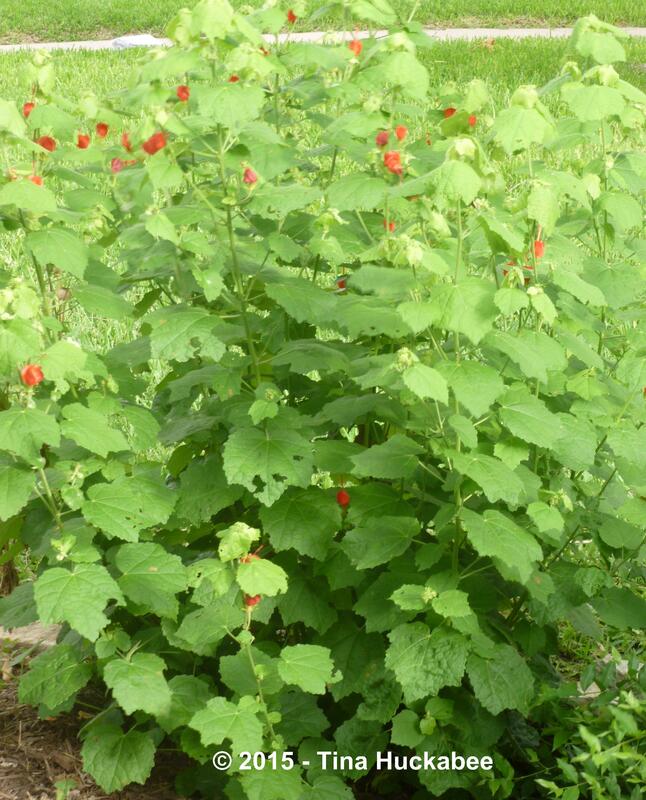 The Turk’s Cap belongs in the Mallow or Malvaceae family, thus sharing many characteristics with other hibiscus plants. 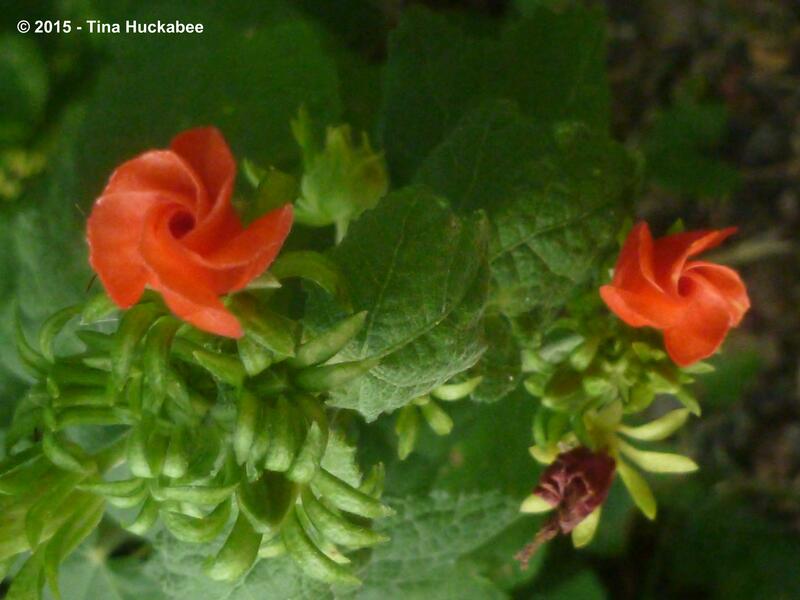 The ruby-red, tiny hibiscus blooms never quite open. 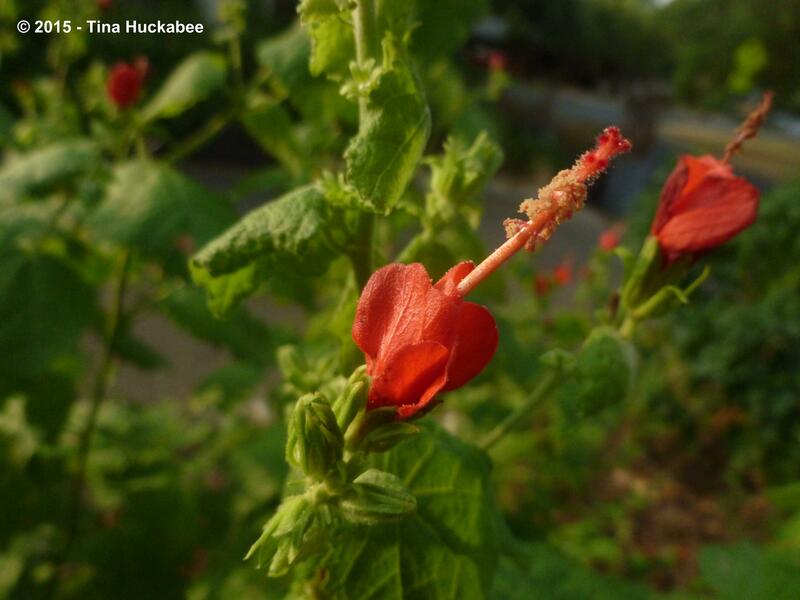 Bees of all kinds, butterflies, and hummingbirds love these blooms. 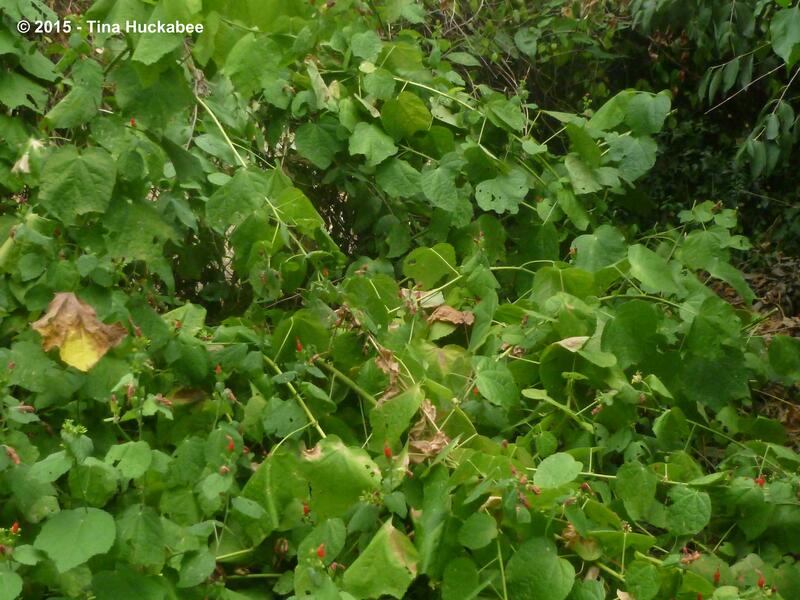 Additionally, because the Turk’s Cap shrubs form thicket-like, birds and lizards use it for cover. Turk’s Caps are considered moderately deer resistant. 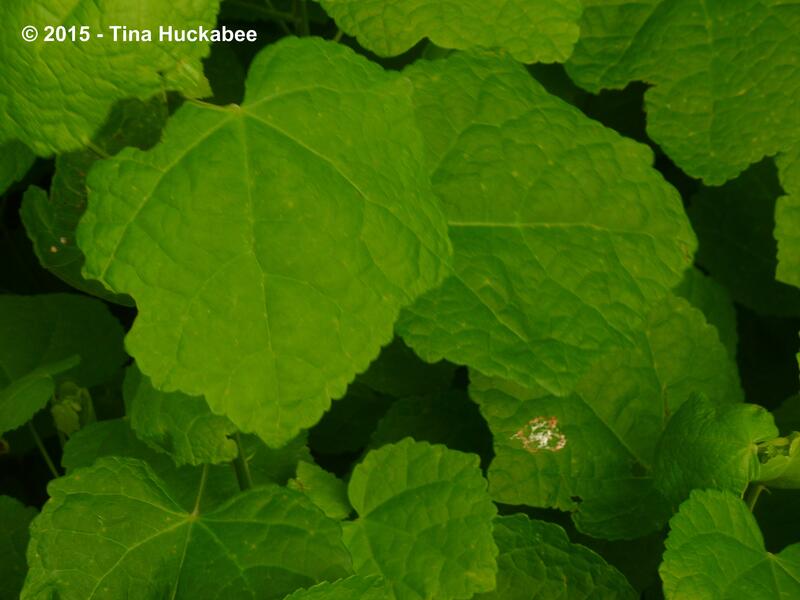 One of the things you’ll notice in these photos are holes in the foliage. During some summers, there is munching of the wide and wonderful Turk’s Caps foliage. In the American garden of the past century, sterile, non-insect attracting plants were the desired garden outcome. As we have come to realize that wildlife is seriously threatened and in decline, the wildlife-friendly gardener recognizes that insects, often the larval stage of important pollinators like butterflies and moths, will eat foliage. Furthermore, it’s actually okay that they eat foliage–that’s what they’re supposed to do and that’s what the plant is there for. 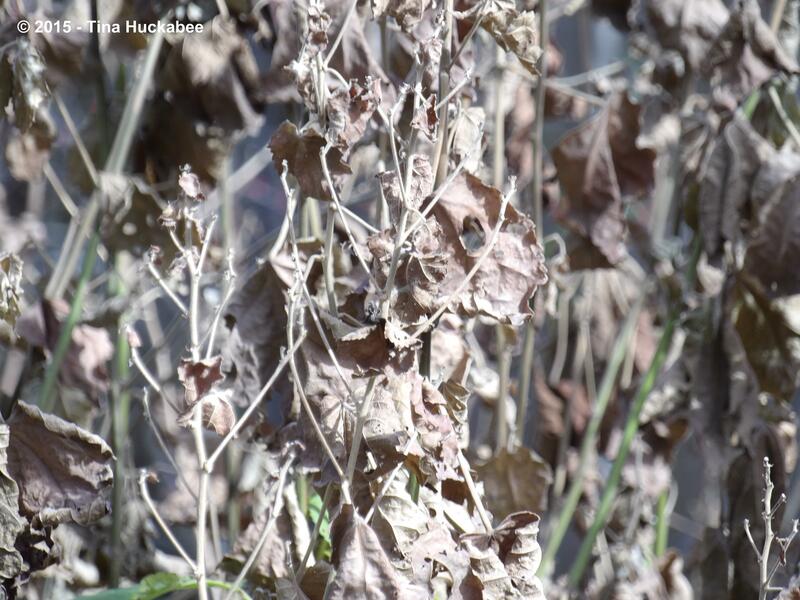 The plant won’t die; it’s uncommon for an insect herbivore to actually kill its host plant. It happens, but it’s not the norm. Are the holes unattractive? 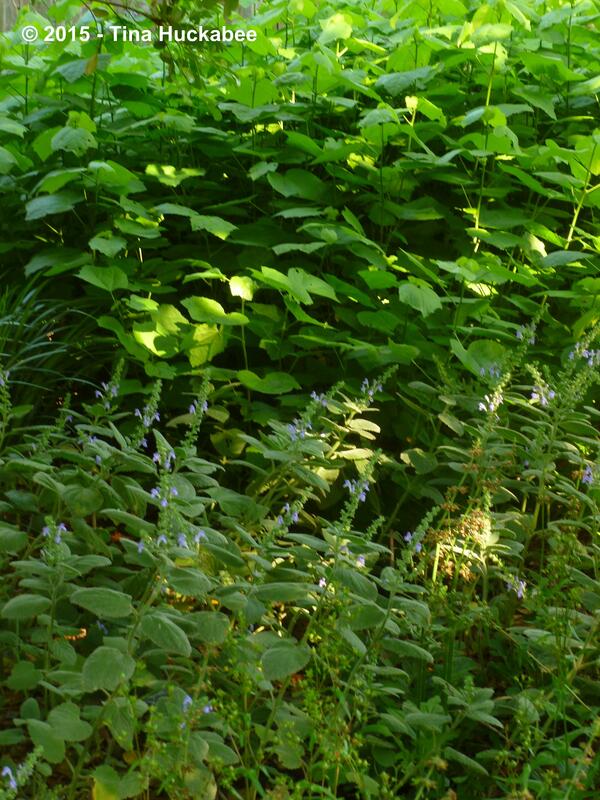 Well, it depends upon whether you want foliage that looks unreal–completely pristine and untouched–or whether you understand that there is a powerful and complex food chain mechanism at work in your garden. I like to think that the holes in the foliage are feeding beneficial insects that become pollinators or perhaps, food for birds or small mammals. Acceptance of some leaf damage is all about perspective and some knowledge of the natural world. Remember that plants were invented to serve insects, birds, and mammals. …and turn a luscious red during the fall months. I’ve never tasted them (not sure why, I should correct that!) but the fruits reportedly taste like apples. 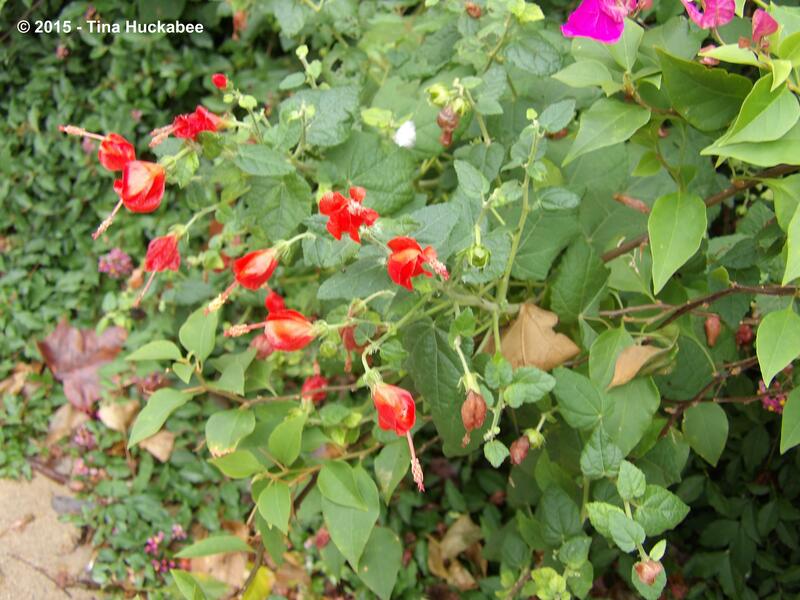 The Spanish name for Turk’s Cap is Manzanilla, which means “little apple”–and you can clearly see why. In my garden, Blue Jays and Mockingbirds are particularly fond of these fruits. 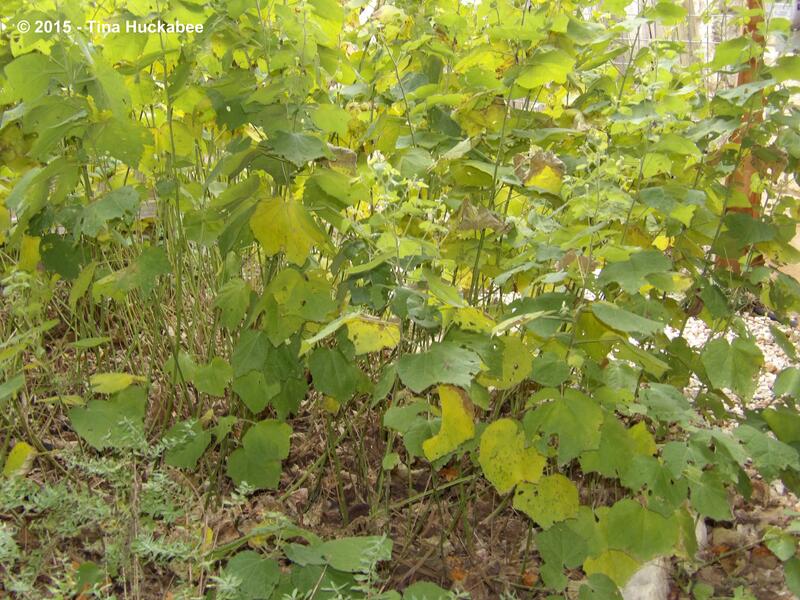 As the days and nights cool, the Turk’s Cap foliage turns yellow. It’s not a particularly spectacular fall foliage display and in fact, the limbs lose some foliage and the plant becomes sparse and spindly during the cooler fall and early winter months, prior to the first hard freeze. 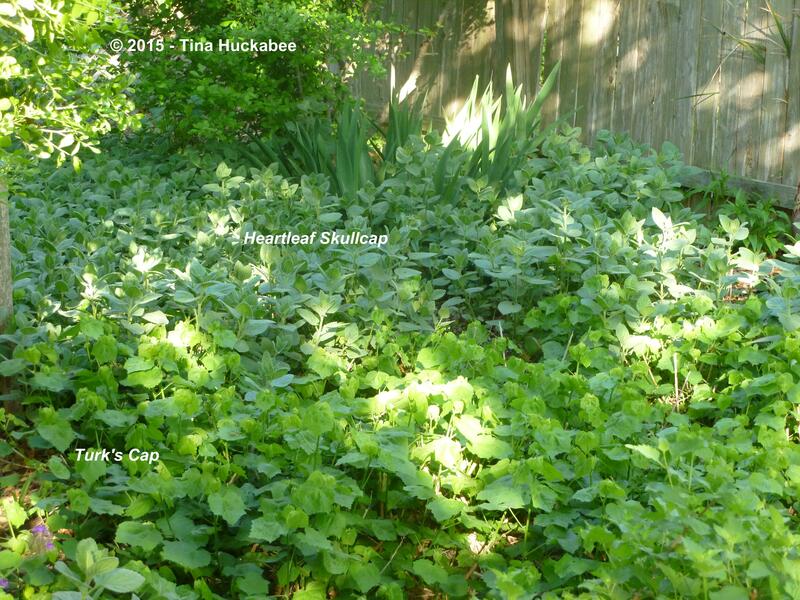 In late fall, If my Turk’s Caps look sloppy, I trim them up just a bit to give the shrub a neater look. The meager foliage in late fall is in striking contrast with the lushness that is the signature of the spring, summer, early/mid fall growth pattern. In my urban garden, it takes a hard freeze to completely knock the Turk’s Caps to the ground for the duration of winter. …I whack them back to the ground. That singular event, usually undertaken in late January or early February, is the major pruning that this plant requires. The result a minimalist garden look, to say the least. 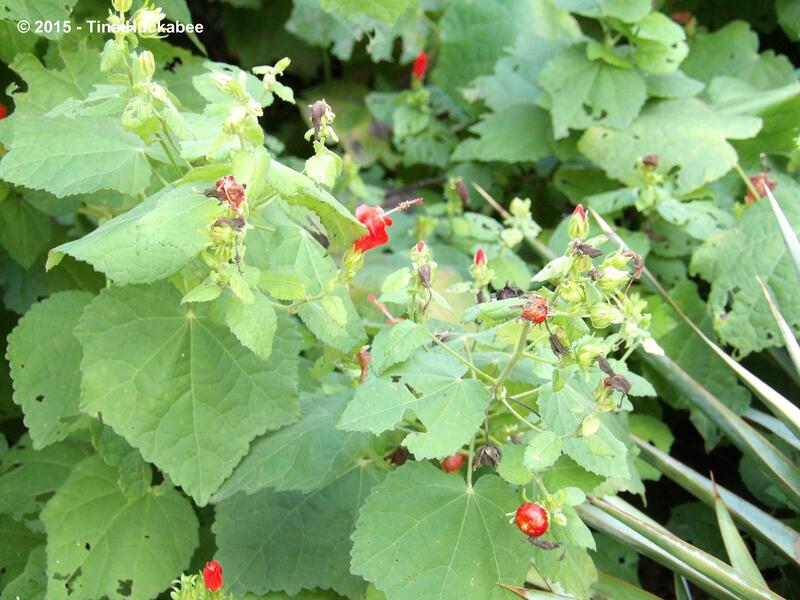 It’s a good idea to pair Turk’s Cap shrubs with evergreen or structured plants so that the minimalist look is, well, minimized. Here in Austin, winters are variable–sometimes they are consistently chilly with freezes throughout on a regular schedule; sometimes winters are very mild with no freezes at all. In mild no-freeze winters, I usually prune the still-green limbs with a few new leaves to about 12 inches from the ground in February. The toughest situation for plants is when a hard freeze occurs early (I define “early” as anytime in December), with the remainder of winter being mild–no hard freezes at all. 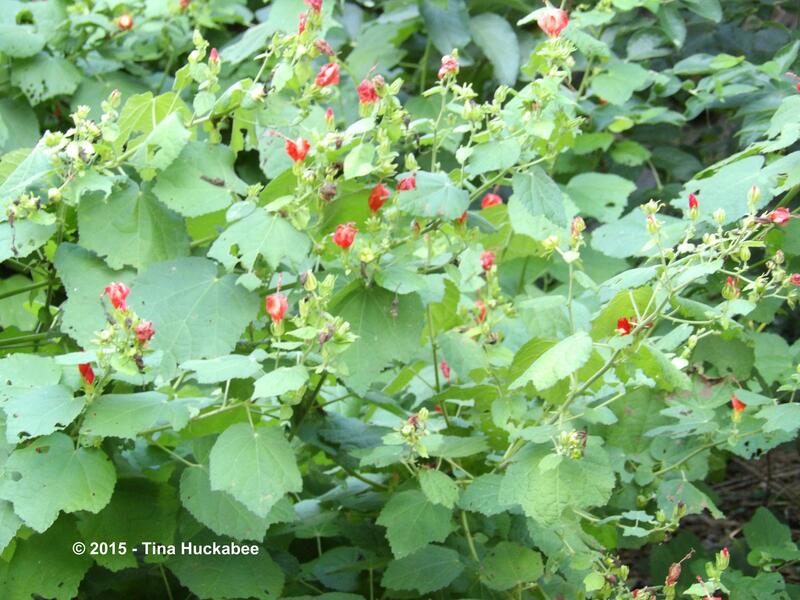 In that situation, Turk’s Caps will flush out with new growth in January or early February. 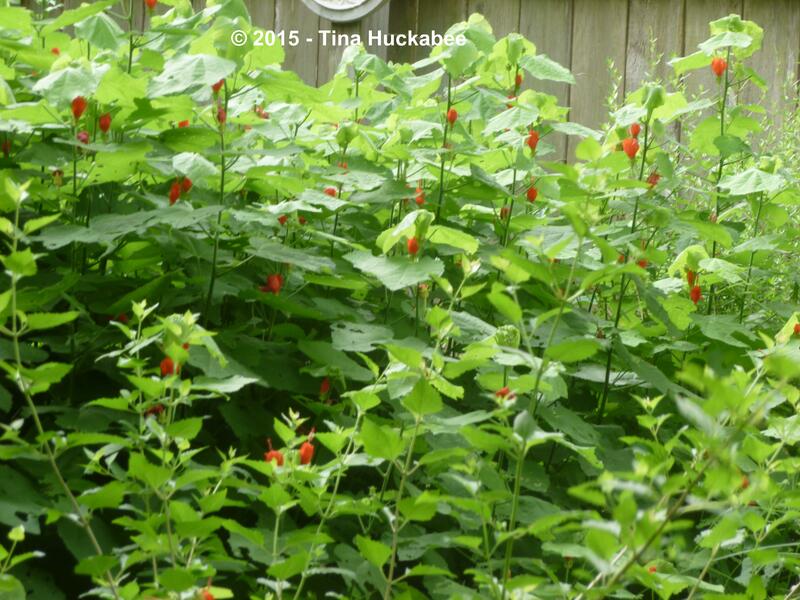 No worries though for an established Turk’s Cap plant; the early growth will be slow and if there is a hard freeze once the new growth appears, the freeze will damage the leaves and maybe the stems, but the tough plant will survive. At that point, prune to where there is green on the stem, sit back and let spring happen. 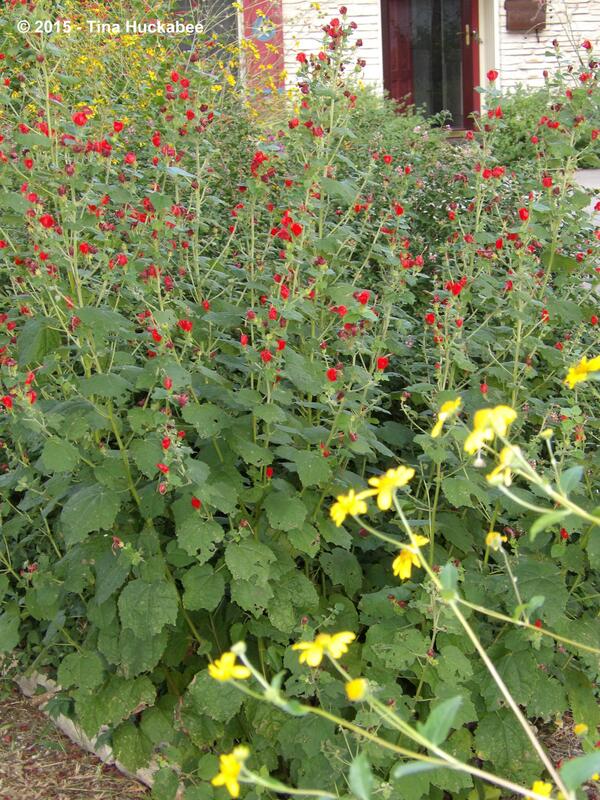 I’ve paired some of my Turk’s Cap shrubs with a native Texas groundcover, Heartleaf Skullcap, Scutellaria ovata ssp. bracteata, because I like the combo of the bright green Turk’s Cap foliage mixed with the subtler, softer Heartleaf foliage throughout late winter and spring. 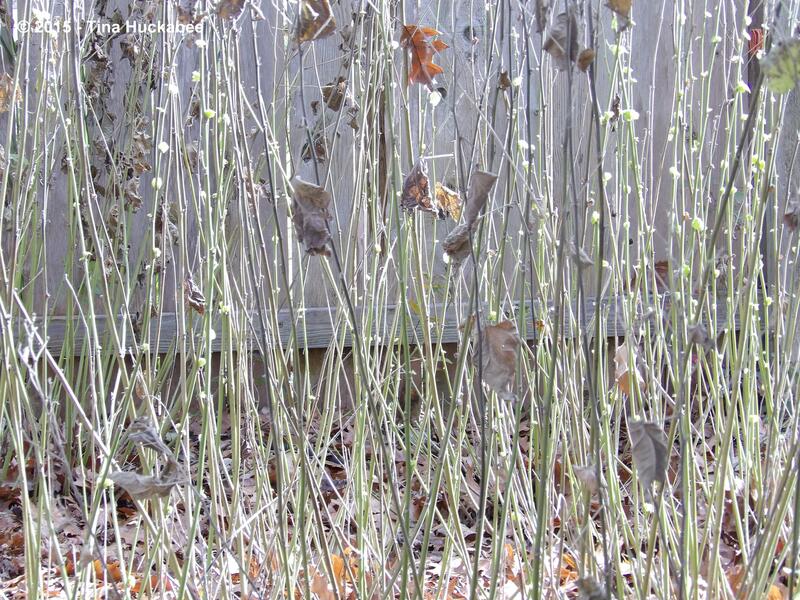 Once past winter’s chill, Turk’s Caps flourish–in foliage and blooms. 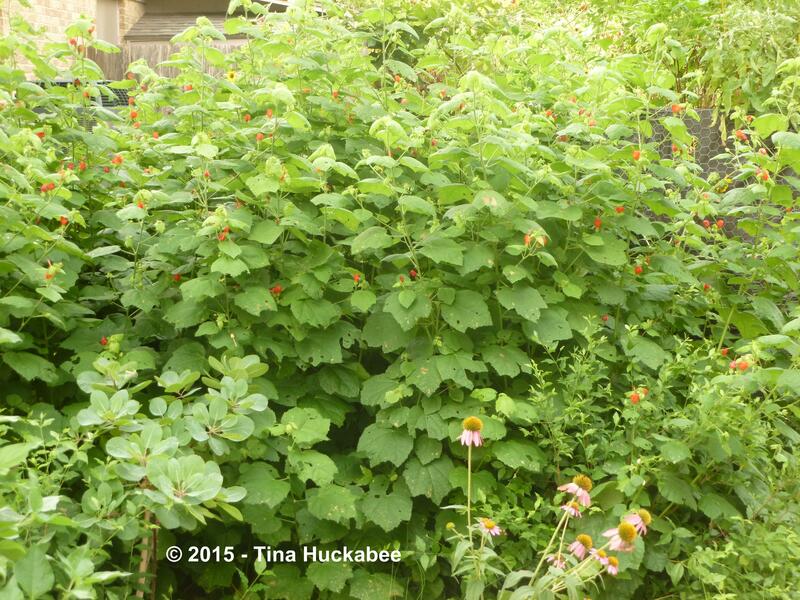 Turk’s Cap is a staple plant in my garden. Lovely and reliable, it’s a rich wildlife plant, as well as being a water wise and low-maintenance plant for the gardener. 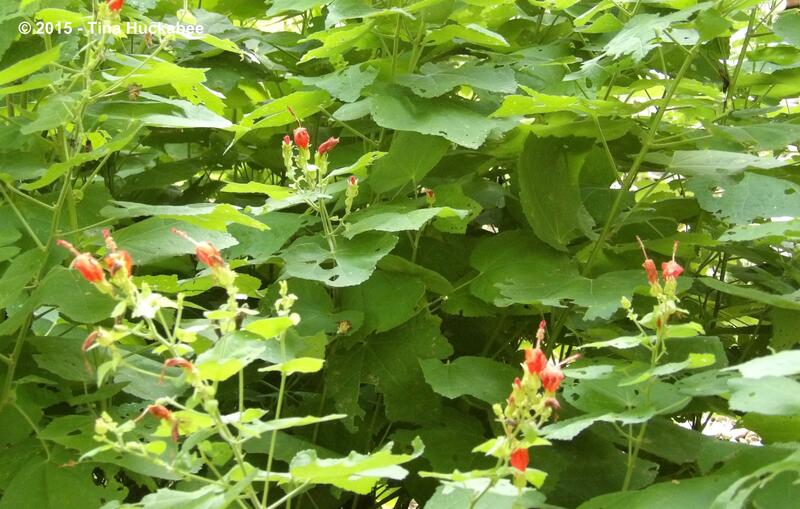 Turk’s Cap is a plant that any gardener who is interested in feeding wildlife, while also enjoying a long blooming cycle, should add to the garden. I’m glad to join with Gail of clay and limestone to profile our wonderful native plants. 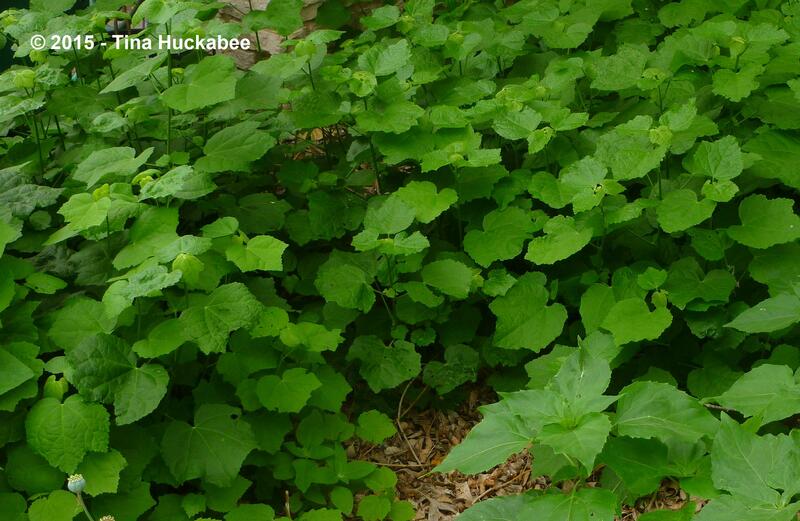 Check out the link to learn about other native plants. 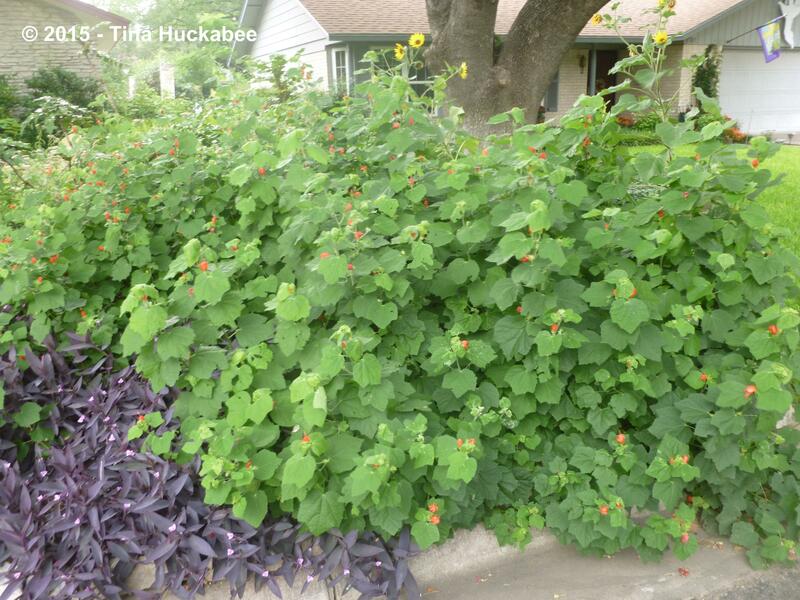 This entry was posted in A Seasonal Look, Turk's Cap, Turkscap and tagged Malvaviscus arboreus var. 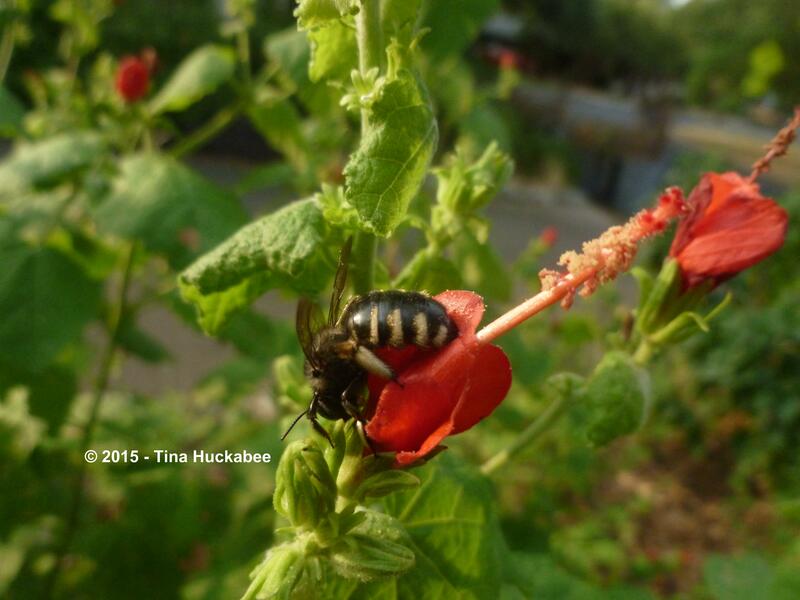 drumonndii, Native plants, Pollinator Gardening, Turk's Cap, Wildlife Gardening by Tina. Bookmark the permalink. Great information. 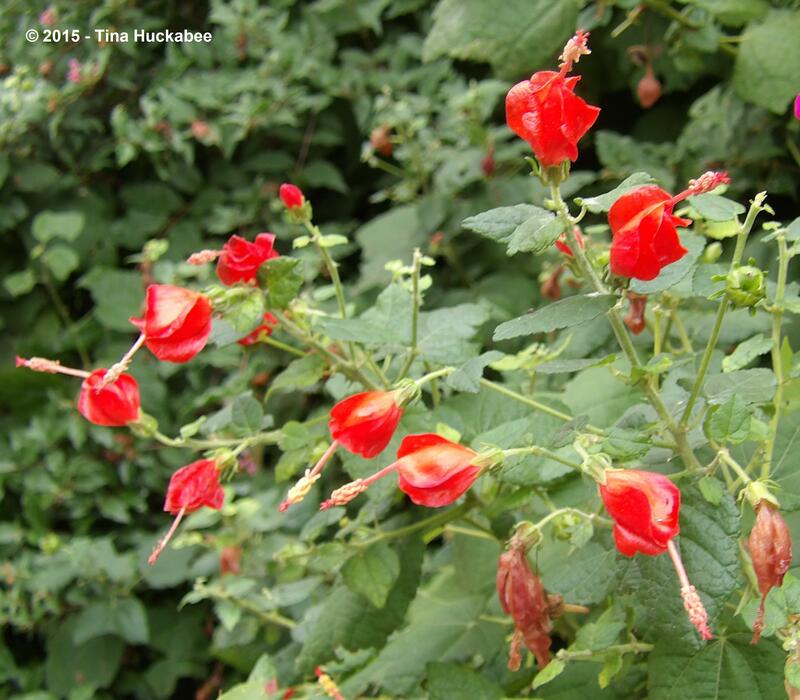 I have a red turks’s cap that has not flourished and is planted in the shade. It has been there for years but stays small. I thought I had it in the wrong place and was going to move it to full sun before I read your post. I also have a Pam’s Pink, which is extremely happy. Hmmm. I don’t know that I would recommend it in full sun, but if it’s not doing well in shade, that’s a bummer. Do you have a spot that gets some morning sun/afternoon shade? That might work. One thing though and I wish I’d mentioned it in the post is that TC is a difficult plant to transplant once established. It’s got a hellacious root system (that’s why it’s so xeric) and is just a tough, tough thing to transplant. Good luck with whatever you decide to do with it. I may keep it where it is…not dead, but not as nice as yours. Will it root from cuttings? I imagine it does, but take from the more tender stems. I’ve always relied on them seeding out–and they’ve never disappointed. 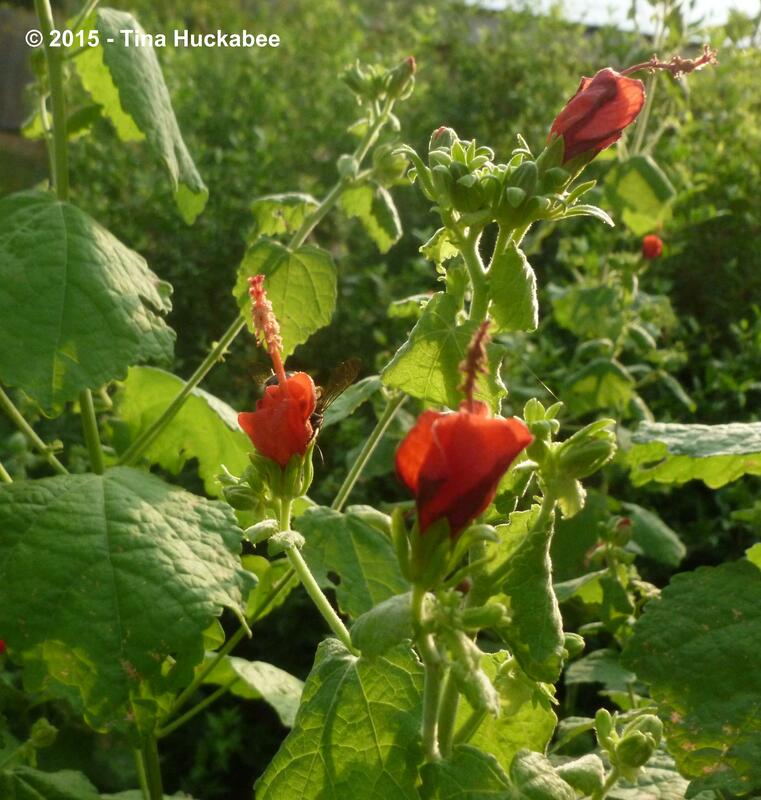 Great article about the Turk’s Cap. Big Momma was named by Greg Grant. 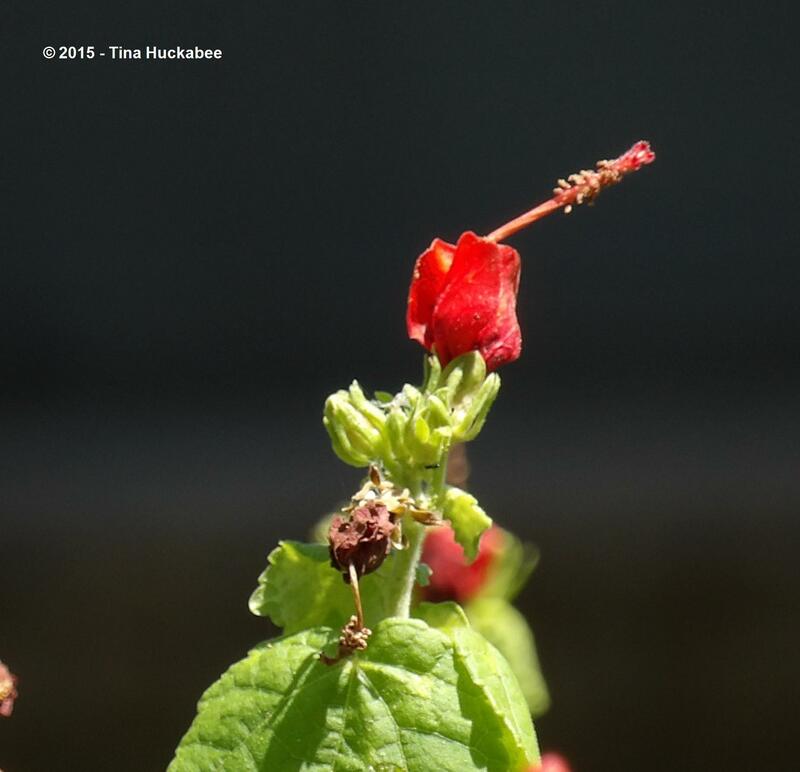 You may want to feature Turk’s Cap Pam Puryear which is also named by Greg Grant. It is a light pink coral color. Thanks, Sherrie. I’m not surprised that Greg Grant was involved with the the Big Momma–he’s done so much for natives and their cultivars in the Texas horticultural industry. I have a “Pam’s” TC, (https://mygardenersays.com/2011/11/21/i-couldnt-wait-2), but I’m sort of “meh” about it. It’s okay. It grows and blooms, but I’m still much more fond of the the true native red bloomer. I used to have a white TC and LOVED it. I transplanted it and it didn’t survive the transplant. For whatever reason, the white TC are hard to come by and I gave up looking for it. But thanks for the reminder and I know that I’m definitely in the minority with my so-so feelings about the pink TC–most gardeners really love it. I had no idea it did well in shade and part shade : ) So much good information. My neighbor had a Turks cap planted years ago. Now it is in several places in my garden and in our alley. And that it dies back is a bonus as it is a fresh new plant each spring. It has been on my plants a client can’t kill list for years! Yup, it’s a good plant for the shady garden. And you’re right–it seeds out. If you don’t want the seedlings, or you want them in a different spot, transplant before it gets too large (1 foot?? )–otherwise, your back will pay for it! 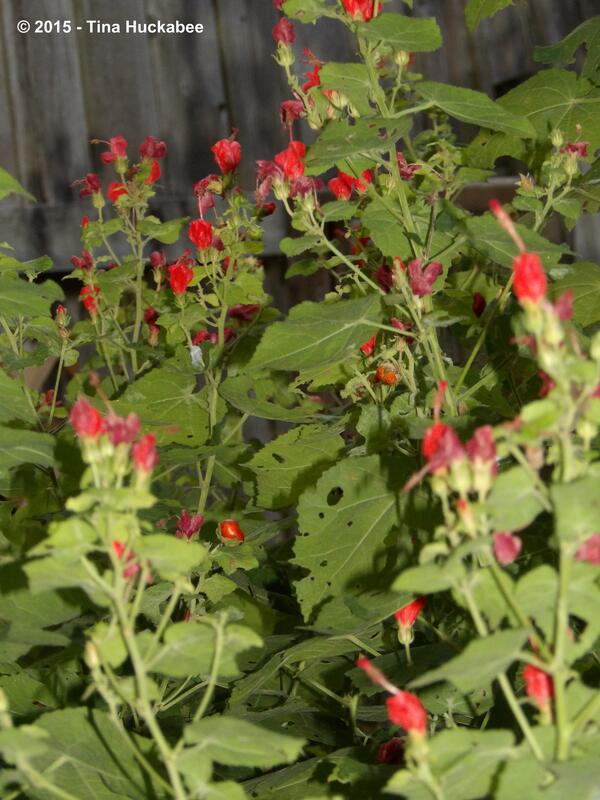 Every Texan should grow a Turk’s Cap! Dagnabit, Tina! I had plans on buying up all the TC at my favorite nursery this fall in order to fill in several semi-shade, everything-there-is-languishing, areas, and now you’ve gone and gotten everybody interested in using more of it! Timing! I tried out a couple of what were labeled “tropical” TC plants with pink blooms and honestly they sort of disappeared after one season here. It could be deer are responsible (I must endure their presence and constant noshing on my plants so I can at least use them as my excuse when plants die, yes?). I do have plans to get several new stands started here. The more of them I plant the more I want. which are drop-dead gorgeous. I’ve never seen them here, but then again, I haven’t really looked. What a great article. These plants were common in older houses in Sydney, but I haven’t seen them for years which is a shame because those red flowers are stunning! Thanks, Matt. That’s really interesting that you’ve seen these in Australia. I guess I shouldn’t be surprised, but somehow, I forget that people “elsewhere” like our plants just like we like plants that evolved in other parts of the world. I agree, the flowers are quite something–oh, that red!! Thank you for all the information. I love TC and have it in 2 places in my garden. The oldest ones are 3 years old and paired with Giant Spiderwort. 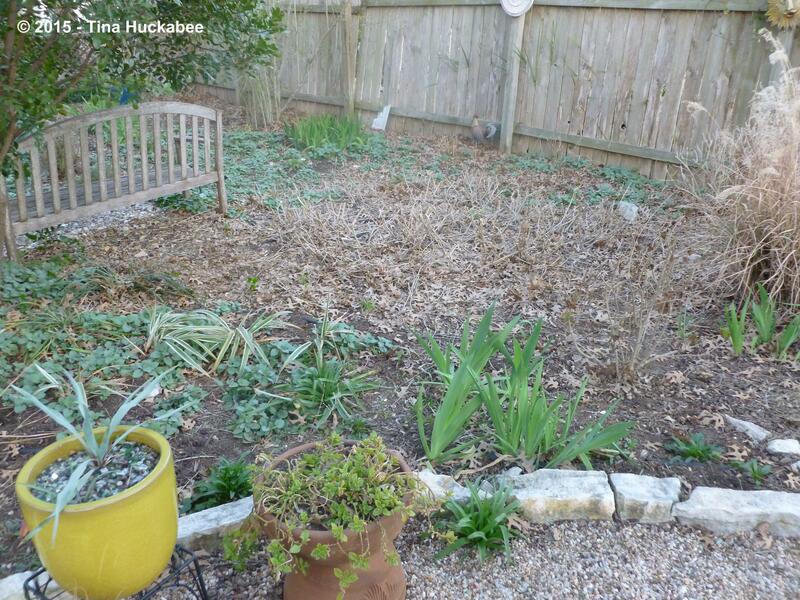 In the winter, the spiderwort fills in the area and about the time it’s getting to hot for it the TC starts to grow. 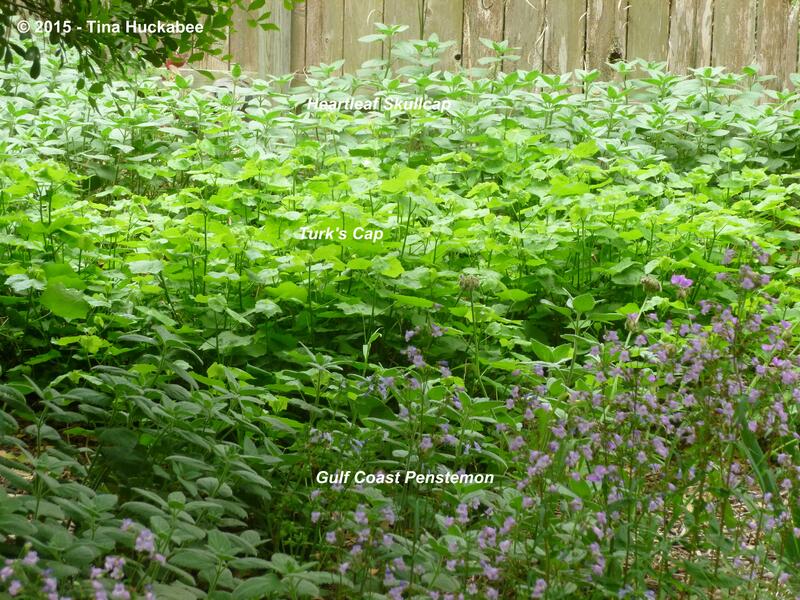 The other area has heartleaf skullcap and I added the TC this year. Since the skullcap tends to die off in the summer, I’m hoping for same effect where the TC fills in the spot when the skullcap starts to fade. I plan to put TC in another area that currently has Fall Obedient Plants that are no longer getting enough sun. Any other suggestions for another winter/spring plant to pair with it? You’re welcome, Margo! Your use of the Spiderwort is excellent–I have some too and probably should have mention it. 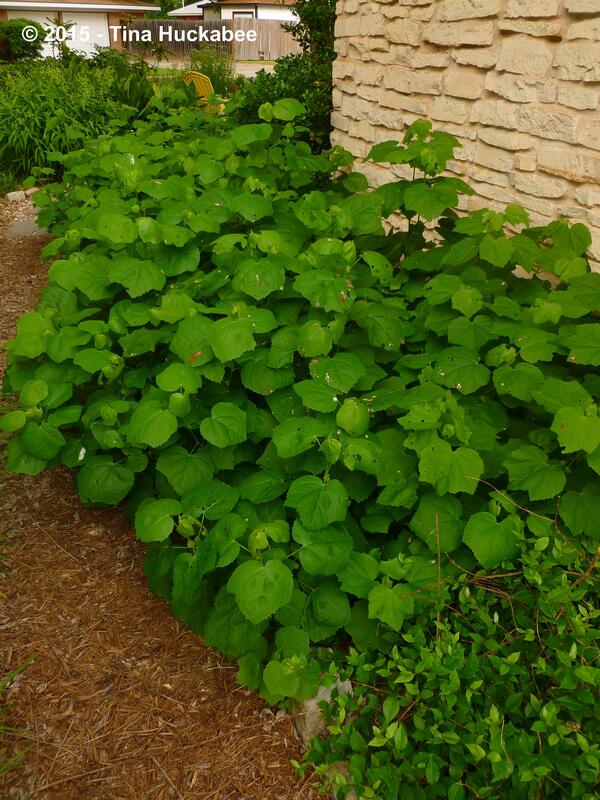 The Heartleaf will work as a good companion plant. I’ve also used irises with mixed results. You can’t have the irises under the TC, or they get smothered by the shade. But I do have some that kind of hang around the summer edges of the TC and they work well. I think the best companions are those that will be evergreen in winter, fading in late spring and summer. Hmmm. I’m sure there are others, but…I’m drawing a blank. Let’s see if we can come up with one or two more?? This is one of my favorites too. 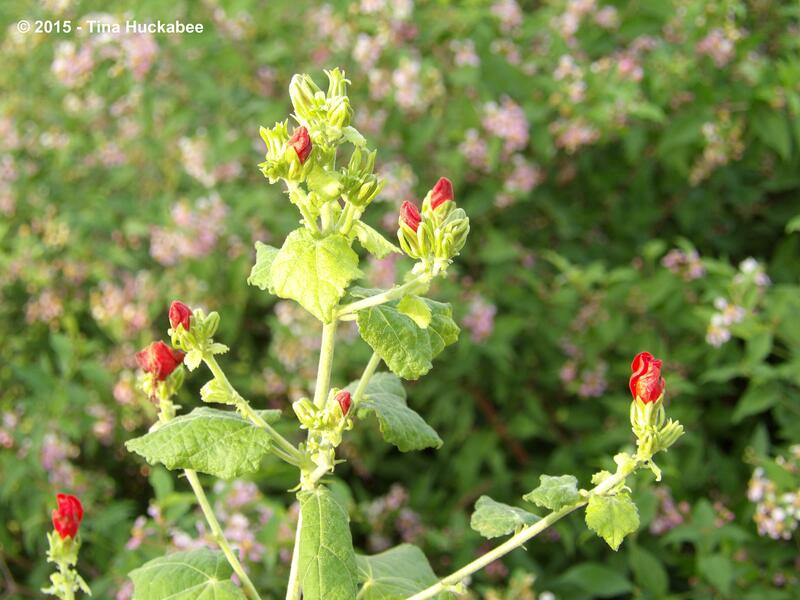 Like you, I pair it with heartleaf skullcap for winter-spring foliage when the Turk’s cap is dormant or just getting started again. I also love it with inland sea oats though. It is nice with inland sea oats. I’ve been thinking of doing just that with a very dark spot, behind a bench that is adjacent to a large group of TC. Great minds, eh?? 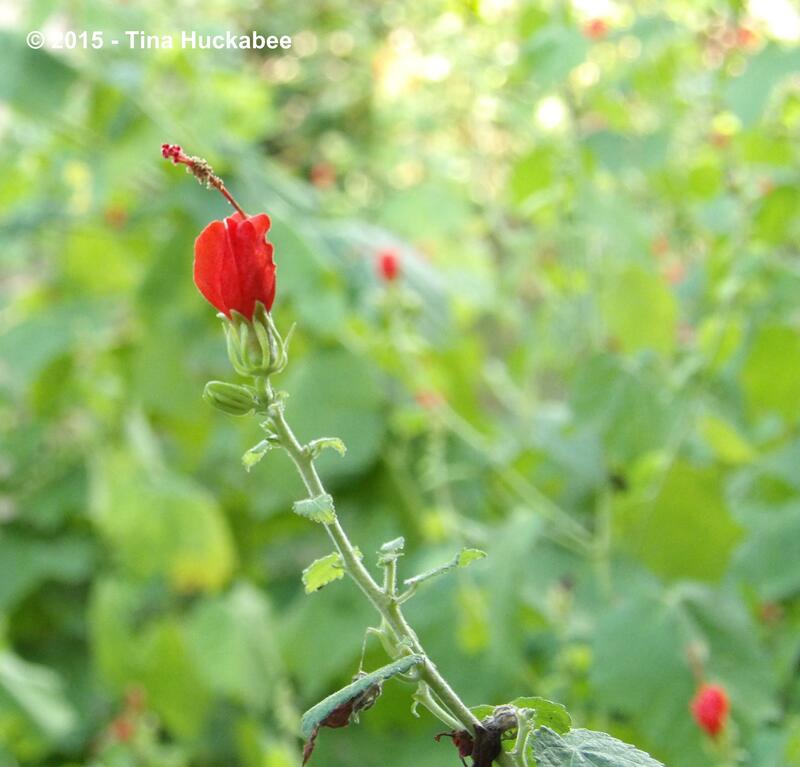 Thank you for such an informative post on Turk’s Cap! You’ve made me want to plant some, but unfortunately, it’s not hardy here in my Illinois garden. What a great plant! Thanks, Rose–it is a great plant. Yes, I imagine that TC is a bit too warm-weather loving to make it in Illinois. But that’s the nice thing about blogging–we can enjoy what others grow, vicariously. Beautiful images. I wasn’t familiar with this shrub, so thank you, although I cannot grow it Is good to know about it. Lovely flowers in the way they remain a bit close, I like that! Somehow, I don’t know why, I didn’t expect it to develop a red fruit! Thanks, Debra. The TC seems very content in my gardens. “Mounding look”–I like that phrase! Trust me when I say that any good experience I’ve gained has been through lots and lots of mistakes. But, thanks! Awe, thanks Michelle. Like you, I see the importance of the gardeners’ role in helping to heal some of the wounds of the world, even if it’s just one little garden at a time. Thank you for your advocacy as well. 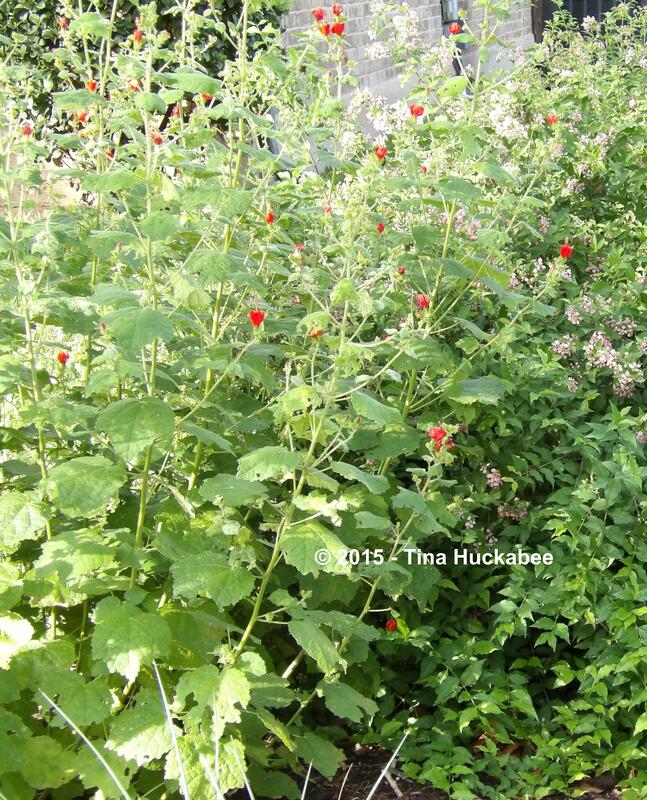 I’m a big fan of Turk’s Cap in the summer when it is full and showy. For some reason, I didn’t get too many blooms this year (mine are sitting in shade). They have been in the ground only about a year, so maybe it has to do with their maturity. The big shrubby foliage really fills out my shade garden during the summer, but leaves it very bare in the winter, so I still need to find some evergreens to pair it with, preferably ones that do well in shade in summer and filtered sun in winter (since they are under a couple large, deciduous trees), and of course, something that attracts wildlife. I’m considering a few dwarf yaupon hollies, but would love to hear if you have any suggestions. Rebecca, I’ll bet you didn’t get many blooms in part because your TC is relatively new, but also because of the foliage growth developed after our wet spring. 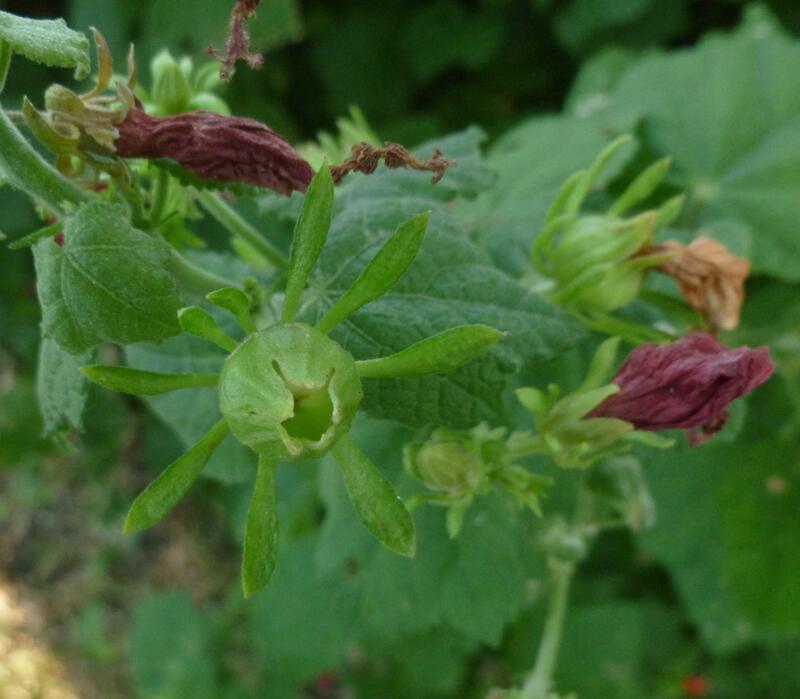 I’ve found that the best blooming years for TC tend toward the dry–in wet years, they just don’t bloom that well. As for companion plants, the Heartleaf is a real winner and Margo (see above comment, August 27) mentioned spiderwort and that’s also excellent. Both will be evergreen and can take being under and along the outer edges of the TC canopy. Another perennial you might try is columbine, but I’m not sure I’d plant it completely under the TC–maybe off to the side a bit? Good luck and let me know next year about your TC’s progress!! Lovely photos and very informative! 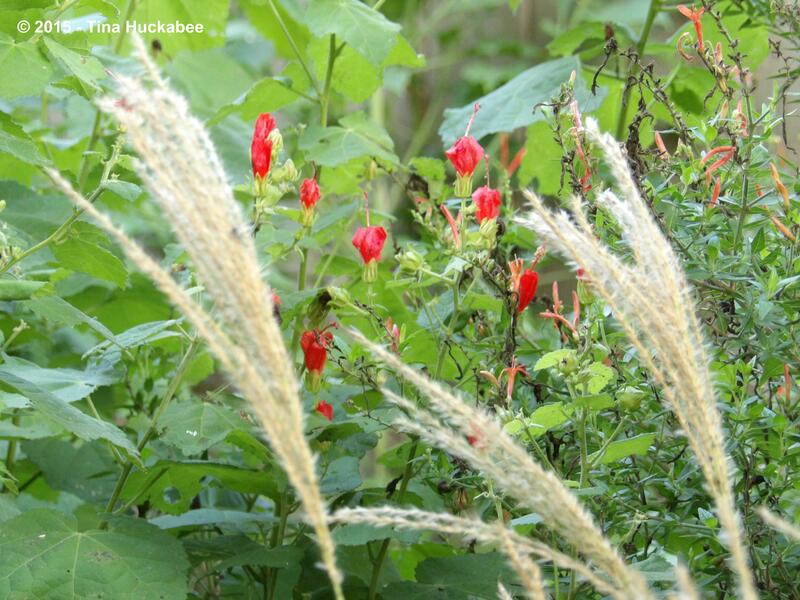 I have Turk’s Cap growing in full sun here in northeast Mississippi. They keep blooming all Summer. I never have to water them even in the hottest, driest Summer. Butterflies love them, and I’ve seen Hummingbirds visiting them, too. The only complaint I have is that they flop over so much I can’t plant anything near them. After reading your very informative post, I may move a few plants to the shade to see if they will stand up better. 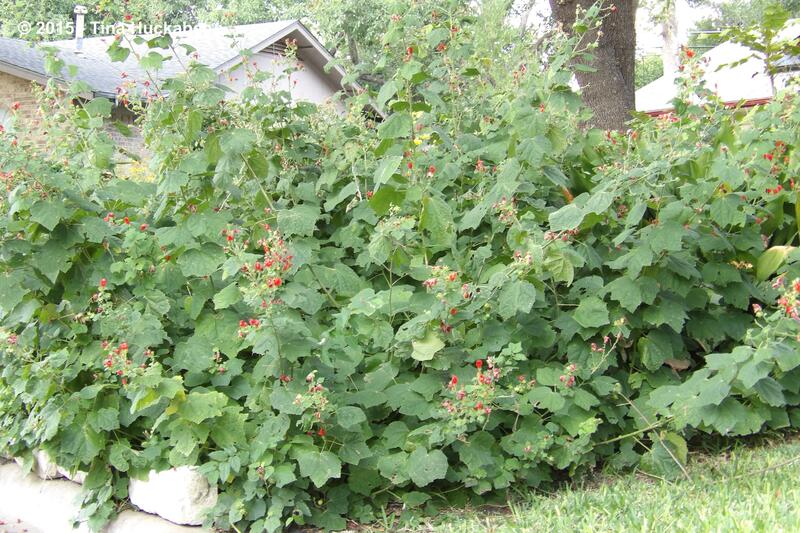 In the Autumn when all the plants are dying back, we run the lawn mower over the Turk’s Cap (they are completely laying down on the ground by that time). They come back each Spring just fine. Thanks Lea! They are floppy plants. I think pruning them in late spring (Horrors!! Even if you have to lop off blooms!) is a good idea if you want them to be a bit tidier, or as Debra says, “mounding”. I’m not at all surprised that they can be mowed down and still come back a’fightin’–they’re tough, tough plants. You have a great day too. Looks like a great plant for your area. Wonderful flowers and foliage. Tina, what a wonderful post. 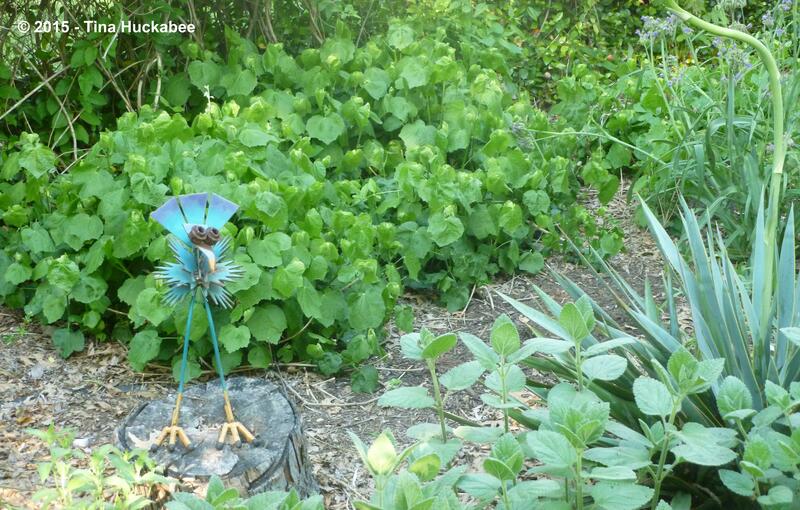 When I started to read, I thought “There’s something I saw in gardens in Texas!” Since I was only in Dallas looking at gardens for a week, it was really interesting to follow the progress of this beautiful plant and how you use it in your garden. The more natives we use, the more life we bring to our garden. Thank you, Barbara! I don’t go to Big D all that much, but I’m sure TC grows there. I love this plant–as I’m sure is evident from the post and think it’s such a valuable addition to our southern gardens. GREAT article! Love the photos. I live in The Woodlands so nice to have a Texas article. My Turk’s Cap were not doing well in one place to a built a raised bed this year and transplanted to another place with filtered sunlight. They still have not thrived but I have hopes for 2017. Hi Veronica–thanks for reading! 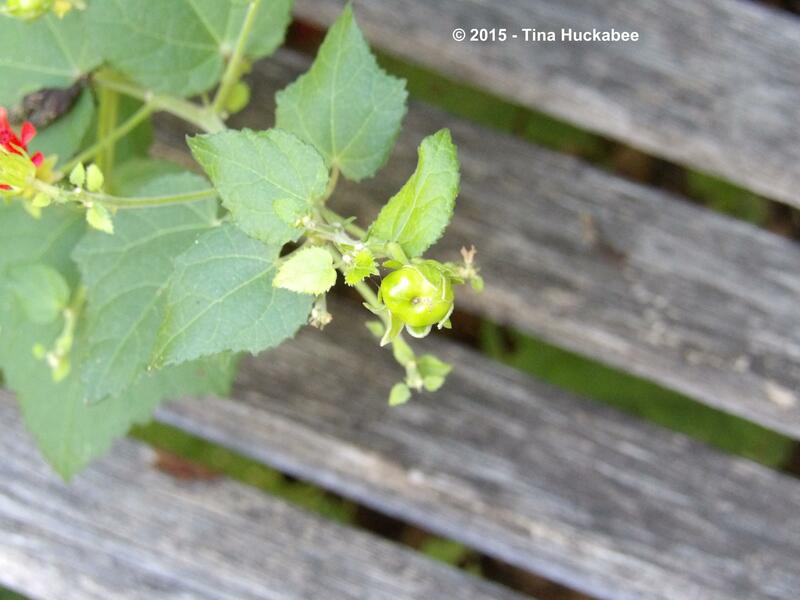 Good luck with the Turk’s cap. Dappled light is just about ideal, it may simply be that they’re still suffering a bit from the transplant. I’ll bet they improve this year.